ClearCruise AR targets on the Hillsborough River. The icons across the bottom of this image allow turning on and off target types. Note the MOB mark 106 feet off our port bow. I spent the last four days judging the Innovation Awards and then attending IBEX, the International Boat Builders’ Exposition. 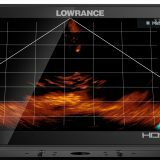 We awarded Raymarine’s ClearCruise AR (augmented reality) technology (press release) the award for the OEM electronics category, and I have to say I’m pretty excited by this technology. I’ve seen a few gizmos like this before (though not marine) and most of them left me more nauseous than excited. So, when I climbed aboard Raymarine’s test boat I wasn’t sure if I was going to see a useful tool or a poorly stabilized jumble you wouldn’t want to use. 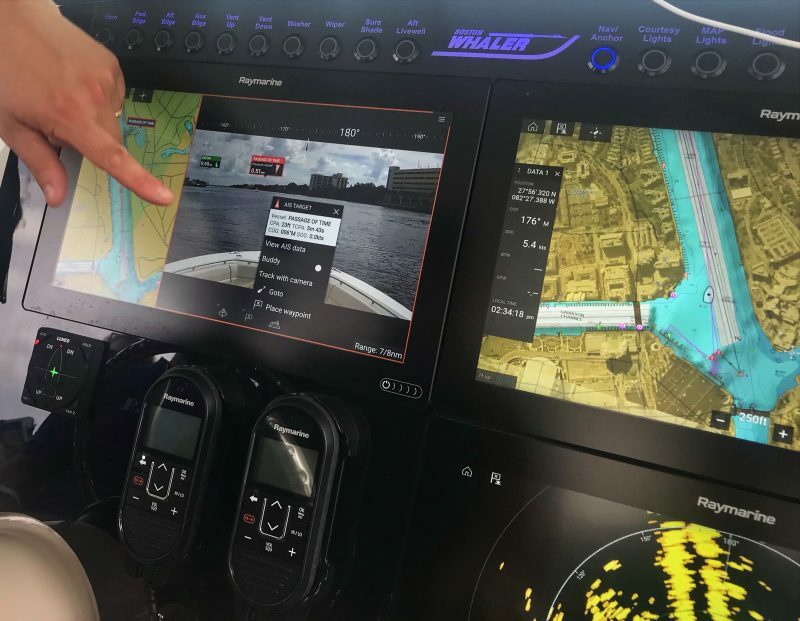 Within minutes of leaving the dock it was very clear (no pun intended) that Raymarine’s implementation is well thought out and will be, I think, a genuinely useful addition for situational awareness. 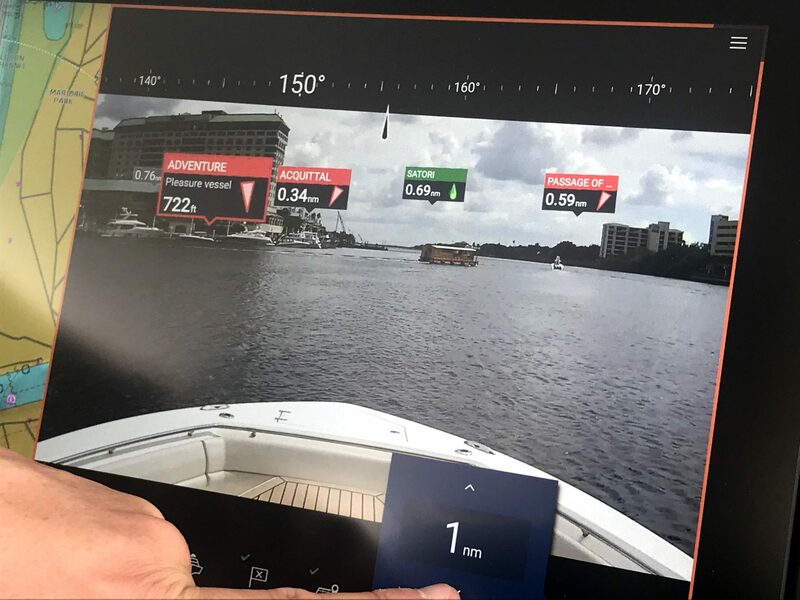 ClearCruise AR strikes me as the next logical step after ClearCruise, the FLIR IR camera feature introduced at the 2017 Miami Boat Show for object identification. 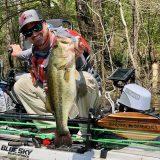 Ben Ellison has been using ClearCruise on Gizmo and plans to report on his experience. In the last couple of years I’ve covered a little shy of 10,000nm in unfamiliar waters. Shortly after we started serious cruising I bought a pair of stabilized binoculars primarily to help identify the numbers on aids to navigation (ATONs). From my brief ride I think ClearCruise AR will likely reduce my use of binoculars quite a bit and make the task of identifying ATONs possibly as simple as a quick glance. 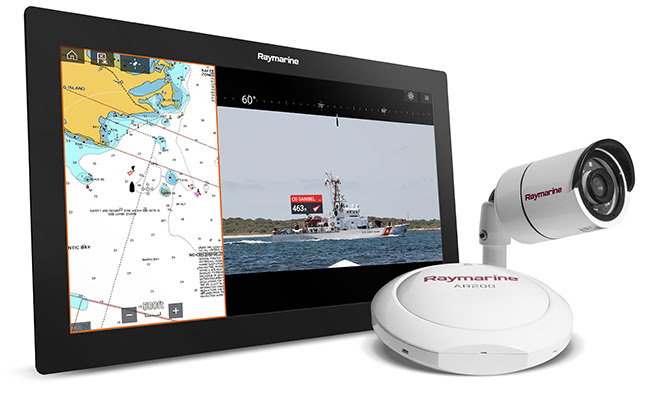 The system is composed of three components: a camera — limited currently to Raymarine CAM210 or CAM220, with FLIR thermal camera support coming; Raymarine’s new AR-200 video stabilization system which contains a high speed GPS receiver, 9-axis AHRS; and an Axiom, Axiom Pro or Axiom XL MFD. Setup is pretty simple, the system needs to know the field of view of the camera, confirm the horizon in the video image and the direction the camera is facing. The system supports both forward and aft facing cameras and switching between them is easily done. The IP cameras will plug into the back of an Axiom or a switch on the Raymarine SeatalkHS network and also needs power. The AR-200 is, I believe, a NMEA-2000 device with power and data connections supplied by the NMEA-2000 network. With the system configured and AIS, Waypoints or ATONs visible on the horizon the system begins displaying flags above these objects. The range and an icon indicating the target type is displayed. If it’s a dangerous target it’s displayed with a red border. The icons across the bottom in the first picture above represent AIS targets, waypoints and chart objects, clicking each one toggles visibility of that object type. Currently radar targets tracked via MARPA can’t be displayed in ClearCruise AR but Raymarine says that’s coming in a future release. Any object displayed in the ClearCruise AR view can be clicked on to view additional details. The type of details vary by object type but follow the normal LightHouse III behavior for each object type. Oh and if you’re wondering what the red exclamation point target is on the first image above, that’s where a man overboard mark was dropped on the Axiom system. 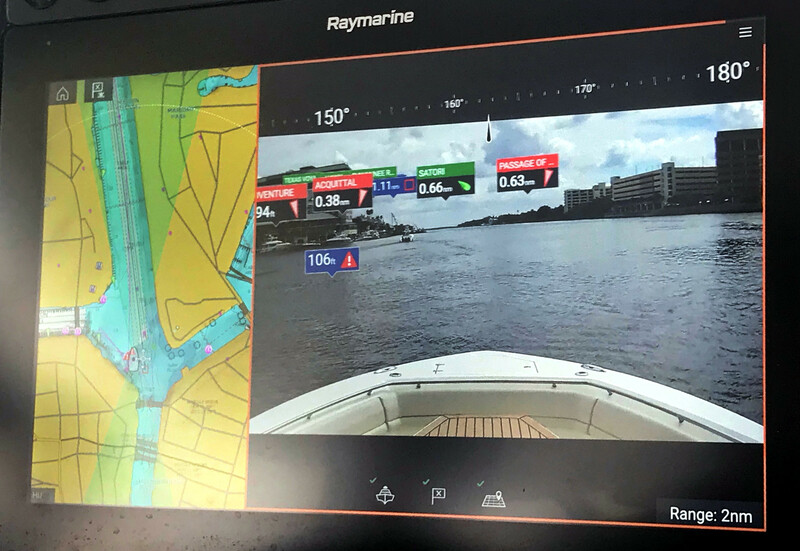 During my ClearCruise AR demo ride, I noted how good the images looked on the big 16-inch Axiom XL displays at the helm of the Raymarine demo boat, and I think that big displays is where this feature will really shine. About the only downside I saw was when a tracked object was behind an untracked object. In the picture above the roofed pontoon water taxi in the foreground is directly in front of the sailing vessel Satori, though the flag for Satori is high enough that it was not too confusing (at least on the big display). 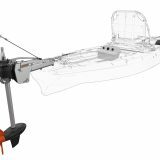 But a couple of minutes later, as we got closer to Satori, a center console without AIS pulled between the Raymarine demo boat and the sailboat, and it appeared as though the flag for Satori was directly on the center console. There’s not a great deal Raymarine can do about that, though one option is to keep the range turned down on ClearCruise. Fortunately, range is pretty easy to adjust by clicking the range indication in the bottom right of the image and then adjusting as can be seen in the image above. The current cameras supported are all fixed cameras so range adjustments only affect the distance over which ClearCruise AR targets are displayed. ClearCruise AR will be available with LightHouse 3.7, which will be released very soon according to Raymarine. The eyeball CAM220 carries a list price of $499, the bullet CAM210 carries a $699 list price and the AR-200’s list price is $499 (there’s not currently a product page available from Raymarine for the AR-200). Pretty cool to see AR features coming to the marine world. I use Marine Traffic’s AR feature like this in congested waterways and harbors on my iPad, and a similar one with FlightRadar 24 when I’m being a plane guy. Both are OK, but tend to be a bit on the barfy side while looking at them. Glad to hear this one is a bit more stable, and look forward to seeing it in the real world. I think some of this, like the FlightRadar 24 one, are more gimmicky than anything, but what they do show is a new approach to how you can consume data and see the world. That part makes me happy, being a super tech nerd, because folks are pushing the boundaries, and eventually we will have more useful features in general. Ben E is right. The roughest water we saw was from our own wake. The system did well with that little disturbance but it was by no means a rough water test. So, where is the review of the stabilized binocs? I need a pair and am about to spend all my accumulated Amazon charge card points on some Fujinon TS-1440s, but sure would like to hear what you ended up getting and what you think of them. Thanks! I will try and do a review of the binoculars at some point in the near future. I have a pair of Nikon StabilEyes 14×40 that I’m thrilled with. 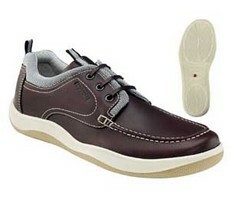 I bought them refurbished from Defender. I don’t have any hands on expereince with the TS-1440s but can tell you the magnification and objective lens sizes are both a good compromise for reading important details from the helm. I would guess on a normal day underway cruising I reach for them a half dozen times or more. The battery life on mine has been excellent. I’ve owned them a year and a half and replaced batteries once. They seem ruggedly built and I’ve had no issues with them of any sort. Hope this helps. Thanks, Ben. I looked at the Nikons you mention above and was struck by how similar they appeared to the Fujinons I’m considering. Here’s a review from Amazon from a guy who bought both, and ended up with the Fujinons. I sure wish these designs were more current! Comparison of image stabilized 14×40 binoculars: Nikon StabilEyes versus Fujinon Techno-Stabi. The great thing about image stabilization is that you can use greater magnification. Without stabilization, every muscle movement, every step you take, every wave under your boat or bump under your vehicle makes you lose sight of what you’re looking at. That’s why the ordinary birder’s binocs use 7x or 8x magnification, while these beauties use 14x magnification. The Nikon and the Fujinon must be made under the same patent or license because they’re nearly identical, down to insignificant details of the battery case. There are only two differences. The first difference is that the Nikon has a switch that let’s you put it into two modes: “land” and “on board”, whereas the Fujinon is always in “on board” mode. The “on board” mode is more general, it compensates both for movement of your platform (walking, boat or vehicle movement) AND for movement of your hands, whereas the “land” mode only compensates for movement of your hands. The second difference is that for me the Fujinon is better, in its one mode, than the Nikon is in either mode. The problem with the Nikon is that there is just a bit of jitter. I only noticed it when trying to see the finest detail. It’s like watching a movie, you see a tiny bit of a jump between the frames of the movie. The Fujinon is as smooth as silk. I could see detail with the Fujinon that I couldn’t with the Nikon in either mode. Hi Ben, any insight into whether the other MFD makers (eg, Furuno) are innovating along these lines? Seems Ray is going all out with these cutting-edge capabilities but I don’t hear anything from the other corners. Thanks. Well, even though ClearCruise AR uses a regular video camera, I suspect that FLIR is very much involved as they are so expert at video processing. 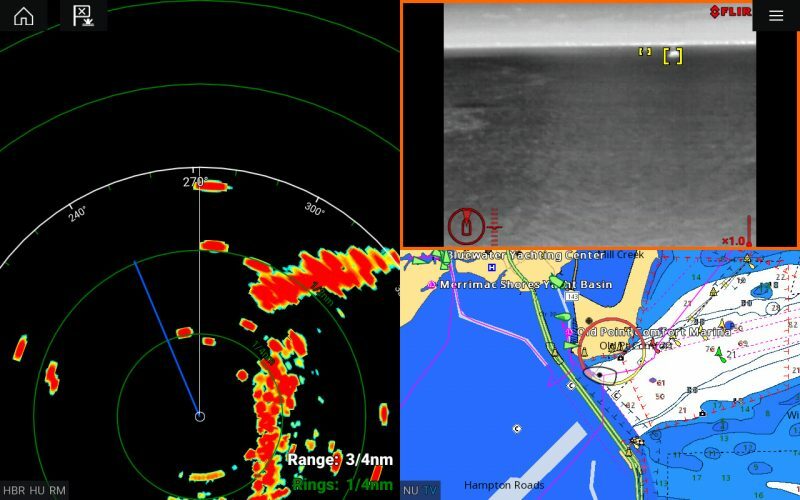 And while FLIR used to open all their marine thermal cam features to every MFD brand — Furuno, Garmin, and Navico can integrate most FLIR cams quite well — that is not true so far of the original ClearCruise solid object highlighting feature, which only works Raymarine LightHouse 3 MFDs (and M232/132 cams). I’m just finishing up an entry about testing that form of ClearCruise and it sure looks to me like FLIR/Ray are blazing a trail that may be hard for others to follow.